Florida International University (FIU) is seeking a business partner to develop and commercialize a Sensor for Detecting Synthetic Cathinones in clinical and field settings. This colorimetric assay is label-free and sensitive, detecting synthetic cathinones at concentrations as low as 100 ng/mL without cross-reactivity to various interferents and structurally similar non-cathinone compounds. 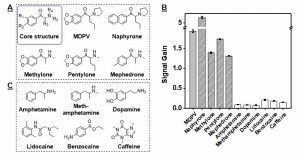 Synthetic cathinones (also known as ‘bath salts’) are designer drugs sharing a similar core structure with amphetamines and 3,4-methylenedioxy-methamphetamine (MDMA). They are highly addictive central nervous system stimulants that are associated with many negative health consequences, and can even cause death. Although these drugs have only emerged recently, abuse of bath salts has become a threat to public health and safety due to their severe toxicity, increasingly broad availability, and difficulty of regulation. More importantly, there is currently no reliable presumptive test for any synthetic cathinone. Chemical spot tests used to detect conventional drugs such as cocaine, methamphetamine, and opioids show no cross-reactivity to synthetic cathinones. FIU inventors have developed a DNA aptamer isolated from systematic evolution of ligands by exponential enrichment (SELEX) binding to 3,4-methylenedioxypyrovalerone (MDPV) and numerous members of the synthetic cathinone family. 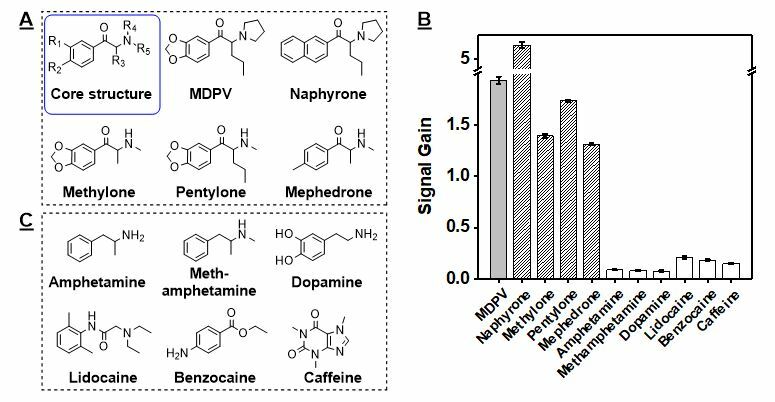 The isolated MDPV-binding aptamer showed high cross-reactivity to other synthetic cathinone analogs, including naphyrone, methylone, pentylone, and mephedrone, but not for structurally-similar drugs, like amphetamine and methamphetamine, and common cutting agents, such as lidocaine, benzocaine, and caffeine. The inventors have developed an on-site colorimetric assay based on the aptamer that can enable detection of cathinones via a clear-to-blue color change visible to the naked-eye within seconds. The absorbance read-out can also be quantified by, for example, a microplate-reader or portable photometer, allowing for high-throughput detection. The assay has a detection limit of 100 ng/mL in 50% saliva and 50% urine.